It has been labelled by some as a clear case of cutting off the leg to save the body, yet on the first day of trading as separate entities on the Australian Securities Exchange, investors added almost $3 billion to the combined value of both companies formerly known as News Corporation. When the announcement was made that News Corp’s publishing assets would be spun off from a newly-created entertainment arm, speculation included many mentions of the declining revenues of newspapers, as well as the possibility that investors had been scared off by hacking scandals on the print side. 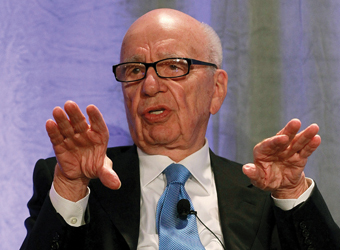 Prior to trading separately, News Corp’s market cap was $75.6 billion. Now, the combined value of both has hit $78.5 billion. Of that, $70.2 billion is the market value of the new entertainment arm. Because they were previously one and the same it’s impossible to tell whether that means both arms have theoretically gained value slightly, or whether one is stronger today and the other is weaker, and which is which. Investors warn that share prices in the early days could be a bit twitchy, so it will be interesting to watch both for investors and the media landscape, but the question still stands: will de-merging the businesses lead to a stronger position for both? The ‘new’ News Corp is the standalone publishing business including The Australian, Daily Telegraph and Herald Sun locally. 21st Century Fox is the new name for Rupert Murdoch’s entertainment arm (he’ll still remain chairman of both) which will include assets such as the 20th Century Fox film studio, National Geographic channels, FX, and pretty much every TV entity with ‘Fox’ in its name.